It saddens me how many times in our lives, we have this conversation. 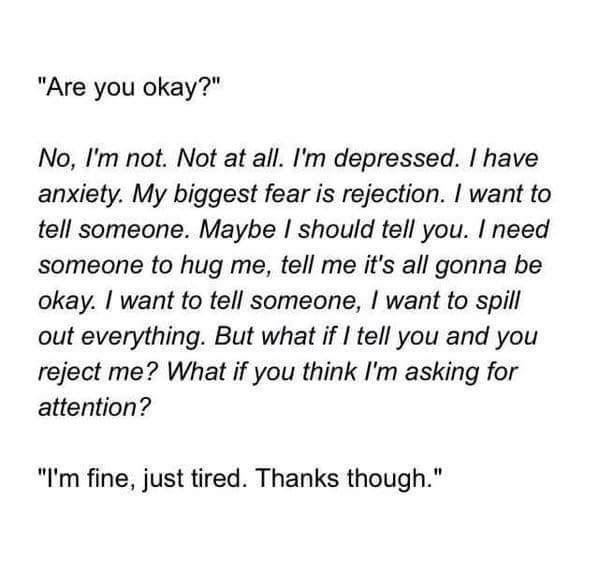 Think about how many times you tell people you’re tired when that’s not the problem at all. I know that I am beyond guilty of this. Being “tired” has become my scapegoat. And maybe the real problem with that isn’t that we say we are tired, maybe it’s that no one ever bothers to question it. Because there are so many kinds of “tired,” it’s important to follow up on this statement. Or maybe, just maybe, we need to stop asking the question, “Are you okay?” Of all the times in your life you’ve been asked that question, how many times have you given an honest answer? For most of us, not very many. It’s hard to answer honestly to this question, because how often are we really okay? More often than not, we have thoughts similar to the ones in the picture dancing around our heads when people ask if we are okay. The next time you ask someone if they are okay, ask yourself this first, “Am I prepared for if they say no?” Because if someone finally opens up about the thoughts in their heads, you need to be ready for that. Because if you aren’t, they will just go back to being tired. And if they tell you they are tired, ask them why or what kind. Because in anyone ever really just tired? Does College Kill Your Personality? Earlier this month, my roommate mentioned something to me that I have not been able to stop thinking about- “College kills your personality.” Is it possible that this is true? After a lot of thought on my part, I have come to the conclusion that yes, it does. Why? For me, most days I feel like a shell of who I used to be. I thought maybe this was a phase or maybe even a part of my depression, but now I’m not so sure. My first clue of this is my passion for learning seems to be diminished. I feel more irritated in class now than I ever have before- all of the information seems so irrelevant. I used to enjoy learning new things for the sake of learning, but now, if it doesn’t apply directly to my future, I just don’t care. My second clue is the extreme change in my moods. Two years ago at this time, it was a rarity to see me without a smile on my face. I was always happy, laughing, and radiating with positive energy. I said “hi” to everyone I knew in the halls, and never let anything get me down for too long. Now, a smile feels almost foreign my face. I frown much more than I used too. I feel that I am so negative and stressed all the time that the simplest thing can bring down my entire mood. The next, and probably saddest, clue is the lack of pleasure I feel from things that used to make me happy. While I still enjoy painting and drawing, it doesn’t feel as natural as it used to. I spend so much time focusing on getting it perfect that I often forget to enjoy doing it. It feels as though art has lost much of its luster for me. I also find myself caring a lot less. I used to put my whole self into assignments, and now I barely but any effort in at all. Why? Because I just don’t seem to care as much as I did. Believe me when I say, this has been both a blessing and a curse. My final clue came today when I told my professor I didn’t feel passionate enough about something to want to write ten pages on it. What!? Did that seriously come out of my mouth!? I don’t feel passionate enough? I have always felt that I was too passionate about things, especially when it came to issues in schools (which is what the paper is on), and now I can’t think of something. Two years ago, in high school, ten pages on something would have been child’s play for me, and now I’m trying to figure out how I’m going to make it work. With these blinding realizations, I can’t help but wonder- is college the cause? Is the stress getting to us, is it merely a part of growing up? Whatever it is, it fills my heart with sadness. So much of who I was seems to be lost somewhere. It pains me to know that I have lost parts of what makes me me. So does college kill your personality? I don’t know, but I think it’s killing mine. “It’s okay to ask for help.” Those are the words we see on suicide, depression, and many other mental health awareness campaigns. But is it really okay? Many times, you will hear that people “didn’t know how to ask for help” or something similar, but is that really the problem. In my experience, this is not the case. There has been one constant factor that has forever kept me from going to people for help- the fear that they will tell. When a child goes to their school counselor and tells him/her they have had thoughts of suicide, what is the first thing they do? Call the child’s parents. When they tell a teacher they have been self-harming- what does the teacher do? Tells the principle, who tells the child’s parents. Even on college campuses, there is always the looming threat of the parents being called. There is also the issue of the rumor mill. How long do you think it takes for something like this to get out, especially in schools? And what’s worse is that many people fill in their own details where the story isn’t complete. When I was going through my depression, the worst thing in the world was the possibility of my parents finding out. I didn’t want them to know, because I didn’t want them to have to worry about me. Other people don’t want their parents to know, because they act negatively towards the issue. I also didn’t want it getting out in my small high school. I feel that this is the problem. It’s not that people don’t know how to ask for to help- they are terrified. I feel that the mandated reporting policy needs to be changed. I understand the issues of being held responsible and legal things, etc., but the system that is implemented in schools now is not working. It is causing students to hide their feelings out of fear, and suffer in silence. Something needs to be done. Parents do not always need to be the first to know. Instead, the school officials and staff should listen to the students, and maybe they can help students work out the issues without bringing their family into the equation. Teachers and other staff members could be trained in how to handle these issues, much like crisis centers and other anonymous self-help lines. If students would be able to go into their counselors’ offices, and know that they would have more confidentiality than they are given, maybe more people would be willing to open up about the negative voices inside their heads.